Demonstrators clash with Venezuelan national police at the Simon Bolivar bridge, in Cucuta, Colombia, after President Nicolas Maduro’s government ordered a temporary close-down of the border with Colombia on Saturday, Feb. 23, 2019. 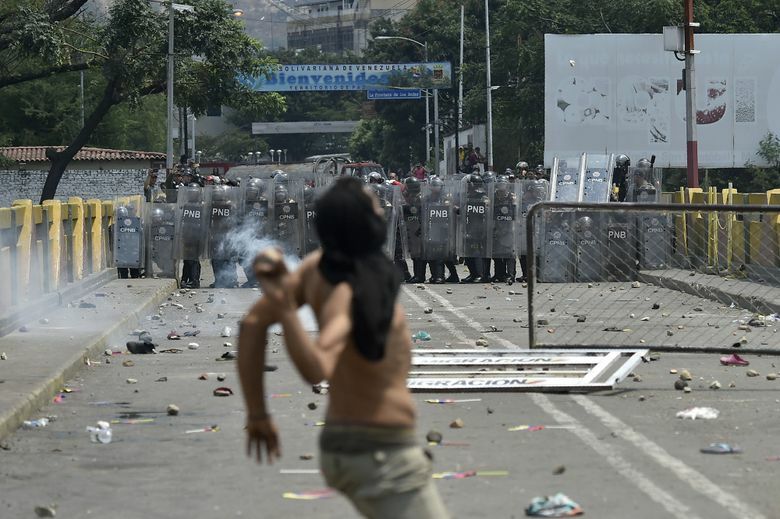 CUCUTA, Colombia – The push to move tons of humanitarian relief supplies into Venezuela Saturday devolved into bloodshed, tear gas and deepening sense of dread, as the Nicolas Maduro administration showed the lengths it would go to keep the aid out. Although organizers said some food and medical supplies were moved from Brazil into southern Venezuela, efforts from Colombia failed. On the international bridge that connects Colombia to the Venezuelan town of Urena, a truck packed with aid crossed the border only to catch fire. Organizers blamed the authorities for the arson. At a second crossing, the Simon Bolivar bridge, efforts to move aid by truck and foot were received with a cloud of tear gas and plastic pellets that injured more than 50 people_ at least two seriously – and kept the convoy from advancing. As the day went on, the crowds in Colombia grew more belligerent, hauling rocks and Molotov cocktails to the front line to battle pro-government gangs, called “Colecitvos,” and the military. As smoke from the burned out aid truck rose over the horizon, those who thought there might be a peaceful way to deliver aid began losing hope. Judy Threos had arrived at the border with a bunch of white roses she had planned to offer to Venezuela’s National Guard as a sign of peace. In the end, the ensuing clashes kept her from getting close enough to even see a member of the Venezuelan military. The aid initiative had been in the works for weeks but it was always unclear how it would be delivered without the consent of Venezuela’s military. Juan Guaido – who mounted a direct challenge to Maduro’s authority on Jan. 23 by declaring himself president – has made humanitarian aid a core part of his plans. And the United States, Chile, Brazil, Colombia, France, Puerto Rico and others have donated millions of dollars to position food and medical supplies at the borders of Brazil, Colombia and Curacao. By all accounts, Venezuela desperately needs the aid, as food and medicine shortages have become commonplace with a tanking economy and hyperinflation. But Maduro has argued that the help is not needed or welcome – and that it is part of a larger Washington plot to topple him. In the days leading up to Saturday, he sent troops to the border and closed key bridges. One of the most dramatic steps he took was to block off the Tienditas international bridge with containers and a tanker truck – welding them to the structure. Although Guaido’s supporters hoped to move cargo over that bridge, that effort appeared to have been canceled – at least for now. Although more than 20 military and police officials defected – running across the border in several spots – the mass military support that some hoped for never appeared. By Saturday afternoon, Guaido said the international community had “been able to see with their own eyes” how Maduro had violated international law. “The Geneva protocols clearly state that destroying humanitarian aid is a crime against humanity,” he said. Ismael Garcia, an opposition congressman in exile who has been helping coordinate efforts in Colombia, said Saturday’s events have irredeemably damaged Maduro’s reputation. “I think today made it clear for the entire world that there’s a criminal gang in power that has no scruples at all,” he said. Maduro spent the day at public events and defying those who are asking him to step aside and make way for new elections. Maduro called Guaido a Washington puppet and “dummy” who can’t think for himself. “It’s time for our people to tell Donald Trump, ‘Donald Trump, Yankee, go home, Donald Trump,” Maduro said, according to the Associated Press. He also broke off diplomatic relations with Colombia, giving embassy staff 24 hours to leave the country. But as Colombia doesn’t recognize Maduro as the legitimate president, it’s largely a symbolic move. What’s clear is that Maduro is likely to face increased international pressure. On Monday, Vice President Mike Pence is scheduled to be in Bogota, Colombia, for a meeting of the Lima Group â a bloc of 14 mostly Latin American countries, where he’s expected to ask Maduro to leave office. Guaido has broad popular support and the backing of more than 50 nations, but Maduro still seems to have the critical backing of the military.